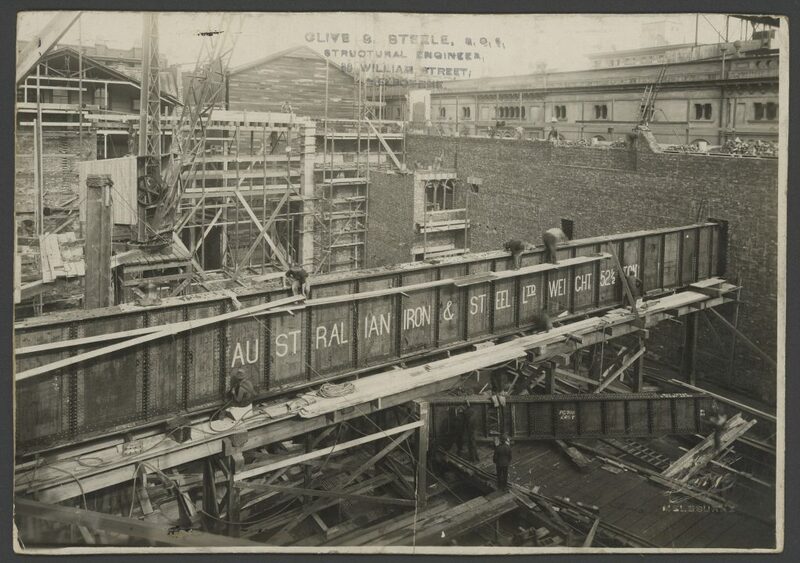 In 1906, a little corrugated iron building was erected on the corner of Elizabeth Street and Little Bourke Street. 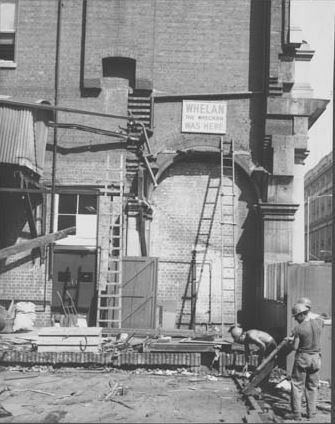 The shed was intended to be a temporary home for the telegraph office until a more suitable location could be found. The arrival of the building went largely unnoticed. 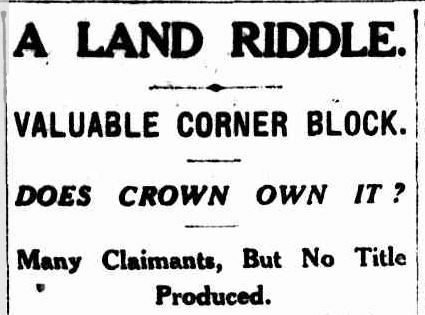 Melburnians had more important things to worry about – the advent of electric trams; Carlton’s ascendancy in the VFL grand final. 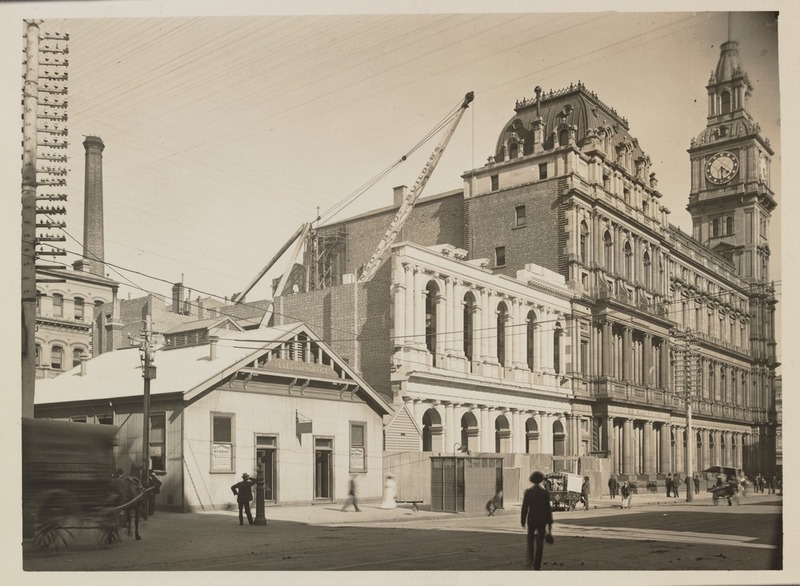 In 1907, the GPO was renovated and the telegraph officers were relocated to the main building. But the little corrugated iron building remained. In 1920, the building was leased out to a motor accessories firm. The years passed. The city around the building grew and changed. Grand new buildings began to appear on the city landscape. People in the city began to talk. When are they going to get rid of that old tin shed? It’s old and it’s ugly. We don’t want it anymore. People began petitioning the Lands Office with false claims. Claims poured in from far and wide, from the vague, to the reminiscent, to the outright fanciful. While some were preoccupied with finding their fortune, others campaigned for the shed’s removal. Suggestions were proffered for its replacement. ‘Shade trees, lawns, and seats of good design would be a positive godsend in such a position,’ garden designer Edna Walling wrote in a letter to the Argus in 1934. ‘A cool place in which to rest, and the beauty of green foliage are so vital to a city’s amenities and so conspicuously absent in Melbourne’. By 1936 the controversy around the old tin shed was full blown. Historian A.S.Kenyon was so incensed by all the rumour and innuendo that he wrote to the Age to set the record straight. Despite Kenyon’s efforts, the controversy continued. Despite Melburnians’ best efforts, the Commonwealth government was unmoved. The shed survived for another 28 years before it was finally demolished in 1964. Melbourne Elizabeth Street Port Office. Demolition of the old tin shed. My father worked at The Old Tin Shed, and made a model of it, probably in the 1970’s. 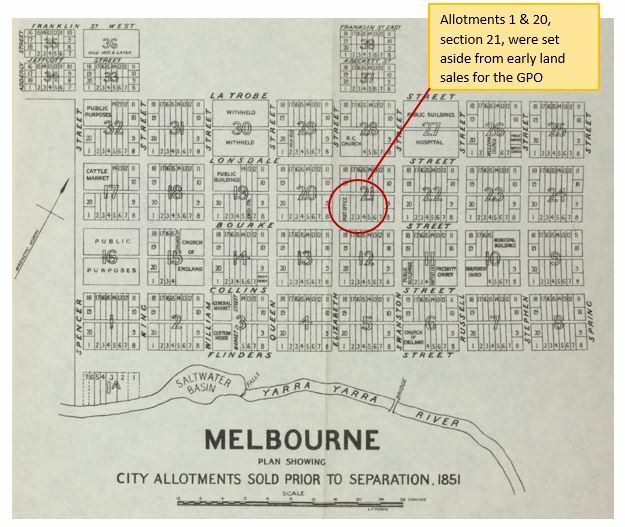 The business moved to Little Bourke Street in the early 1960’s. The model was included in an exhibition by the Museum of Victoria in 1986. Great research Sarah, if it was still standing one would presume Melbourne’s trendiest cafe/restaurant would be operating. What was old is now new !! I remember the ‘old tin shed’. Didn’t know the history – terrific research Sarah. My grandfather used to say that he owned it at one stage: no evidence to prove it though, unfortunately. I am sure there was a little park on there for awhile in the 70’s and 80’s. Where i used to go at lunchtime. Quite right! My favourite lunch spot in those days. My aunt told me that a Moylan owned it. Lovely – as usual, Sarah – but with the tinted bird’s eye view of Melbourne, can you tell me which street that is, cutting diagonally across from the right hand corner? Hard to identify so many of the (long gone) buildings…. Great little snippet of history, nice photographs. Anyone else recall that long bank of telephone booths that used to be on that site in the 80’s? They fronted on to Little Bourke. Oh, wow, yes I remember those phones! I worked at McGills opposite for 20 years and used to have my lunch in the little park on that site. Yes, I’d forgotten about those phone boxes ! I remember the old tin shed. Thank you for all your research which is fascinating. 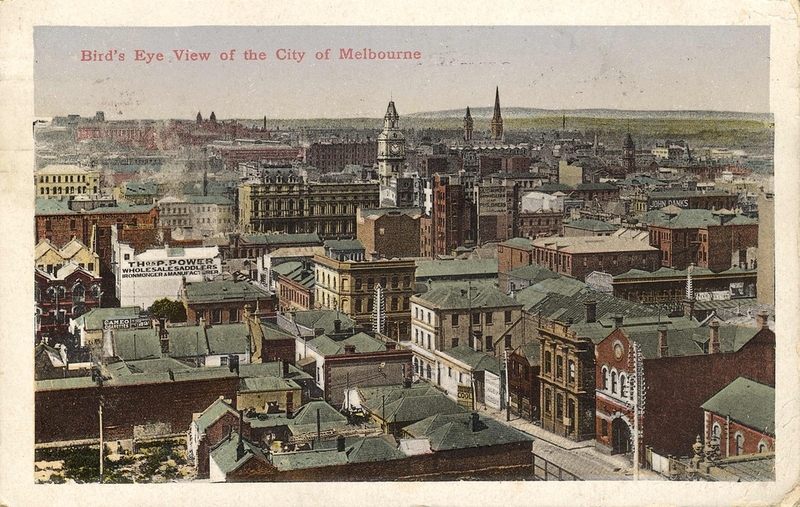 @ Judy, if you look at the online version of the bird’s eye view print, it looks as though the street you are querying is Lt. Bourke St, looking eastwards towards the front of the Post Office building. Great snippet on early Melb.No don’t remember the Tin Shed but recall the bank of telephone booths in a concrete public square. I made Wedding day arrangements from one of the phones in 1974. Thanks. 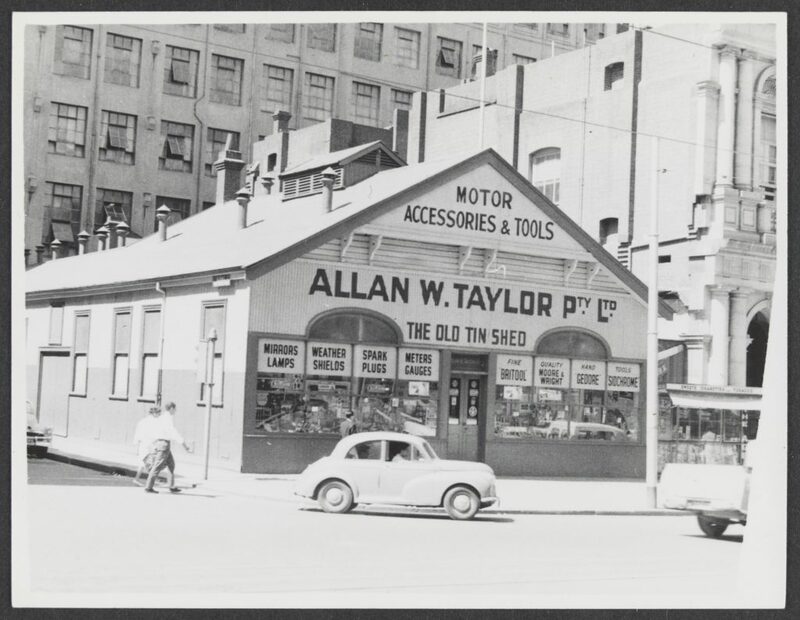 My father Peter Wyatt finished his working life as proprietor of Allan W Taylor Pty Ltd, long time tenant of The Old Tin Shed. The business sold motor accessories and tools. Peter joined the business as a teenager in approximately 1931 and retired as owner of the business, aged approximately 70 years, in the mid 1980s. Allan W Taylor Pty Ltd was his sole employer throughout his life. 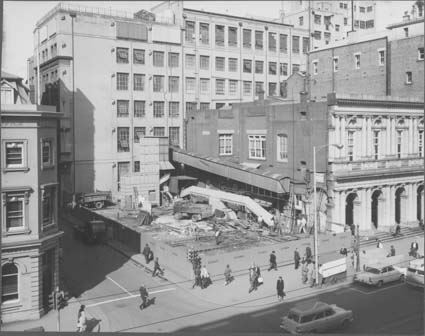 When the Old Tin Shed was demolished, the business relocated to 248 Elizabeth Street, and subsequently to 369 Lt Bourke Street. 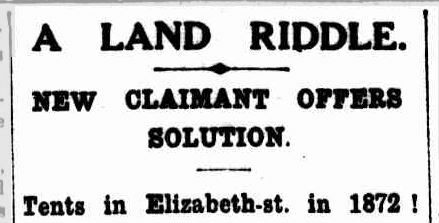 In addition, the business also held premises in Lonsdale Street for a short period. 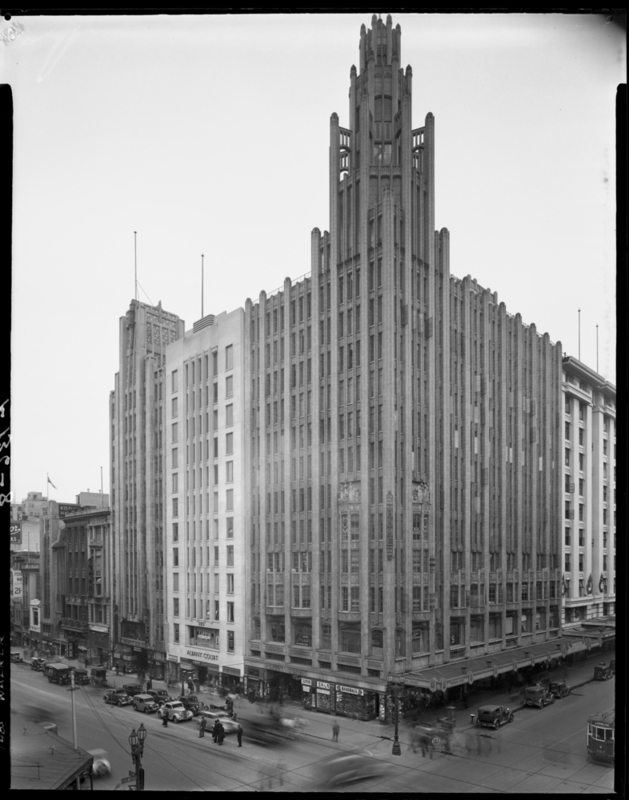 As a teenager I worked as a typist in the typing pool of the Postal Services Branch of the PMG’s Department on the first floor of the GPO building – from our office window we had a good view of the action in Elizabeth Street and our ears became attuned to the donging of the GPO clock especially as mid-day rang out! In years to come our typing pool became transformed into a glamorous coffee shop! Don’t know what’s there now!